Patrick Vieira is an Arsenal legend – one of the finest players and leaders ever to grace the Highbury pitch, the Frenchman won three Premier League titles with the club, became an Invincible, and scored the winning penalty in the FA Cup final with his final kick of a ball for the Gunners. Little wonder then that many Gooners took some interest in Vieira’s situation this summer as he was tentatively linked with the Arsenal job after Arsene Wenger stepped down at the Emirates Stadium. The Daily Star suggested Vieira was a candidate alongside another former player in Mikel Arteta before the job ultimately went to Unai Emery, with Vieira heading back to France to take charge of Ligue 1 side Nice. It’s not been the easiest start for the 42-year-old, but, to be fair to him, he has got his team doing that age-old, oh-so-frustrating thing that Arsenal do – trying to walk it into the net. 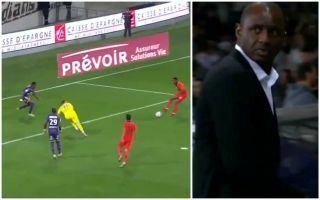 Watch the video below as Vieira watches on in horror as his side contrive to miss what is essentially an open goal for a good few seconds…sacre bleu! What an absolute shambles of an attack ?